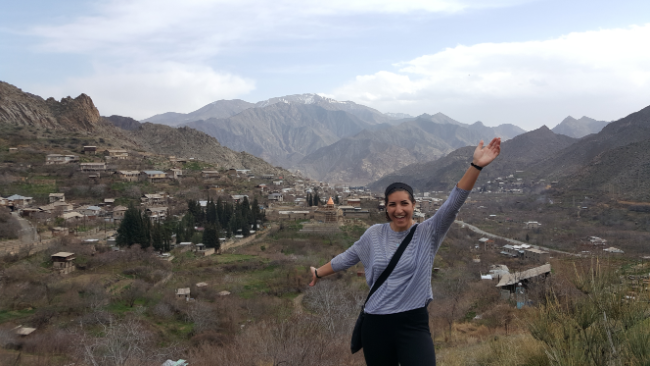 After my long day of travel from Yerevan to Meghri, I hit the ground running the next day and did some intense Meghri sightseeing. Kelsey had work, so I was on my own. I got tips from her about what to do in town, and then I did all of it. 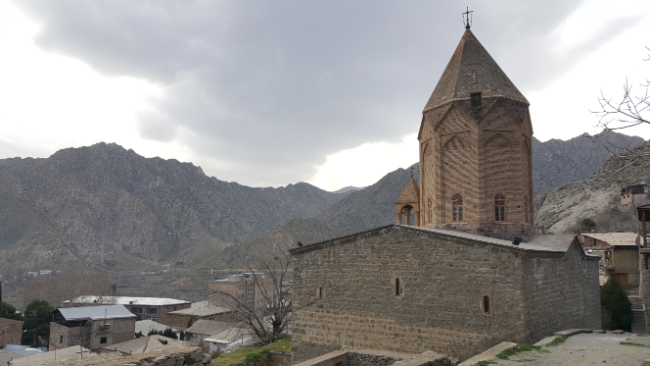 In Meghri, the major attractions are parts of the old Meghri Fortress (four parts, though who knows, there might be more), three churches, and a nice view of Iran. 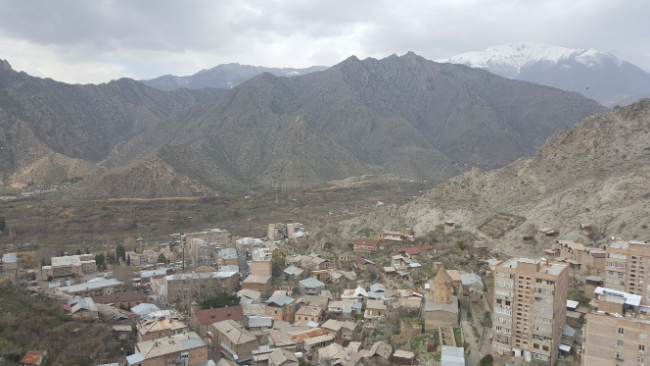 I started with the two fortress parts on the ridge closest to Kelsey’s apartment, and the trek there involved some sketchy felt-like-trespassing-but-what-does-that-mean-in-Armenia-anyway moments. 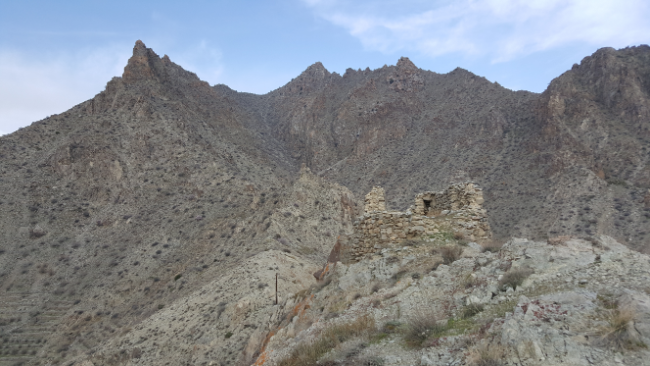 There are houses all along the bottom of the mountain ridge, and I had to get past the houses somehow… I walked through someone’s open gate and no one said anything, so that was that. 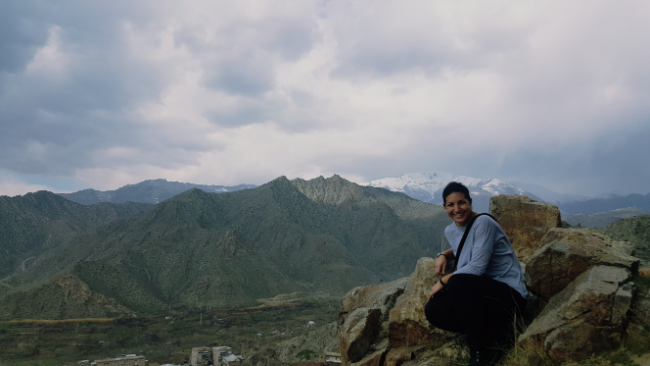 I’ve decided that the Meghri mountains are my favorite for climbing. They’re very rocky and steep which means that climbing them involves a lot of basic rock climbing/scrambling. It makes things interesting! I think that’s way more fun than just hiking. The views from both places were awesome. Throughout the day, I took about a million pictures of the same mountains over and over again because they never got less cool. The never-ending struggle of travelling alone is remembering to take pictures that you’re actually in… and also figuring out how to physically take those pictures. Selfies aren’t my favorite, and I usually have a mini tripod, but of course I forgot it and all of the pictures on this trip are going to have to be improvised rock tripod pictures. 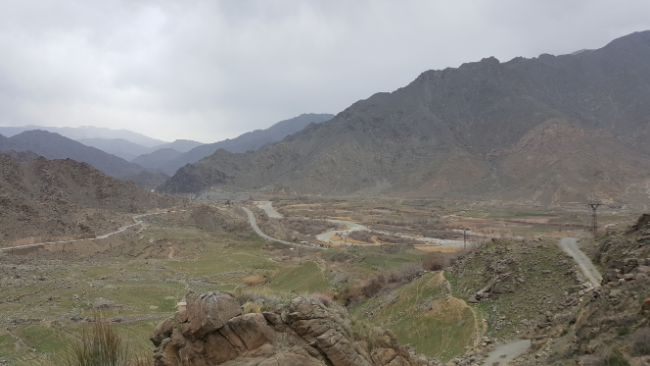 From there, I adventured down the other side of the ridge because I saw a road that I thought met up with the one I wanted to take to see Iran. That was kind of right… I got there eventually, so that’s all that matters. I also found a bonus church! I was walking down the street past some ruined buildings, and I saw a little peek of an arch that looked like part of a church. I decided to check it out, assuming that, as usual, no one would care that I was poking around, and sure enough, there was an altar inside! Who knows what happened to the church, but now it’s filled with grass and, based on the poop, grazing animals. I felt like I had stumbled upon a hidden treasure. 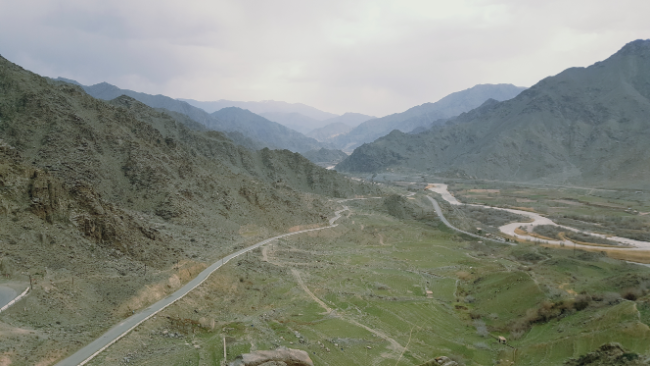 Finally, I found myself on the road to the view of Iran. 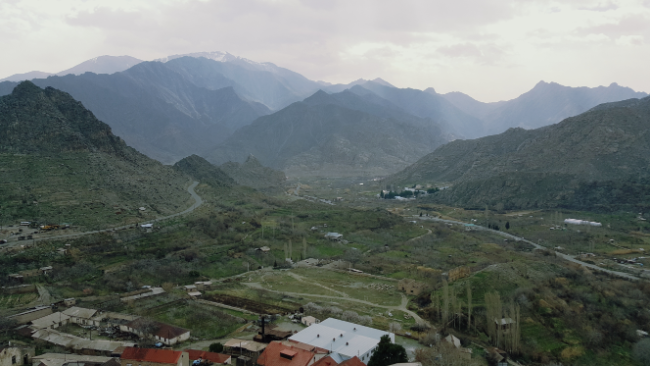 I mean, you can see Iran from pretty much the whole town, but there’s a road that zigzags in that direction, so I walked down until I hit a little ridge that had a clear view of the Araks River and the border. Of course, I climbed the ridge because why not? I also took a bunch more pictures of the same mountains until it started drizzling and getting pretty windy, and I decided it would be wise to head down and avoid getting blown off the mountain. The murky looking squiggle is the Araks River. 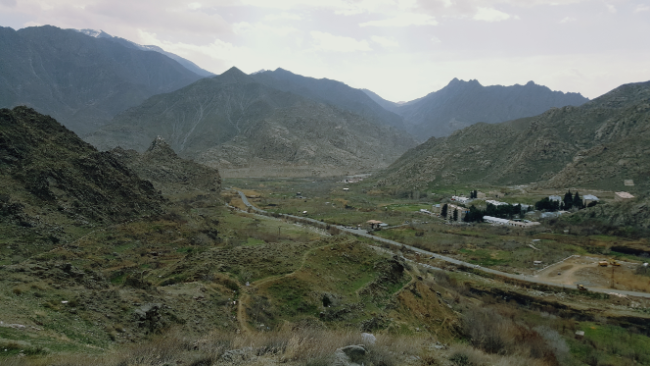 It runs along the Armenia/Iran border. Luckily, the rain didn’t last too long. I say luckily because I didn’t have any rain gear (following a morning conversation with Kelsey where she checked the weather and assured me that it wouldn’t rain… oops), and that earned me a stern talking-to from an old woman who I passed on the street. Instead of taking the main roads, I chose adventure and walked down some dirt roads that seemed to be heading in the direction of the church I wanted to see next. 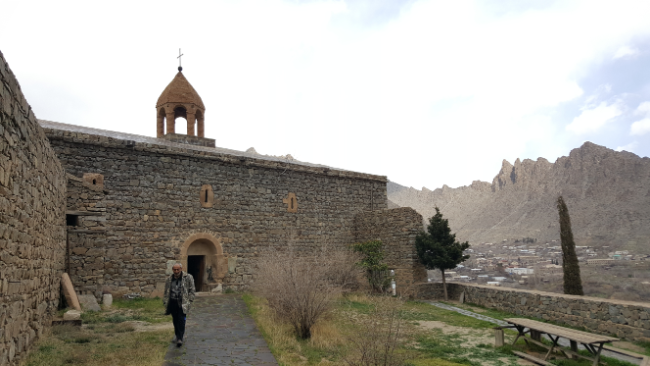 It kind of worked… after some winding around, I popped out on a main road again, and from there, I headed to the 17th century Surp Sarkis Church (thank goodness for phone GPS). Again, I didn’t really know where I was going. I walked on the roads that looked like they were going in the right direction until I hit a dead end and asked some nearby old men how to get the rest of the way there. My Armenian isn’t fabulous, but it’s usually good enough to understand directions. This time, not so much. He said something about taking the high path and then turning after going under the balcony and then something something something and I was completely confused. After one explanation attempt, the guy giving me the directions gave up and just went with me. I definitely would not have figured it out on my own. I don’t think I would have understood even if he had told me the directions in English. We went up this little path, walked under a balcony, around the corner, up some steps, across a rock, up some more steps, and we were there. The inside of the church is filled with frescoes, and based on the scaffolding inside, I’d guess they’re getting restored. That exciting because they’re really nice already, and if the colors were a little bolder and less chipped, they’d be breathtaking. When I was finished looking around, my friend and I headed back to where I picked him up. He invited me to come in for coffee, but I said “no, thank you” because I had a packed schedule to keep. 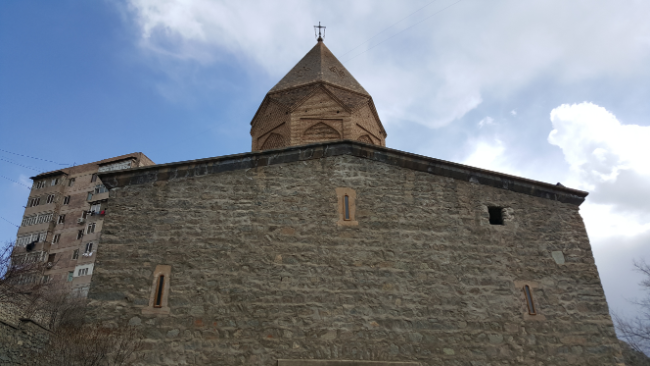 My next church was in the middle of town, Surp Astvatsatsin Church (17th century). The main part of the church is stone, and the cupola is brick. Brick isn’t that popular in Armenia, so it’s a little weird to see that on a church. It was pretty though. 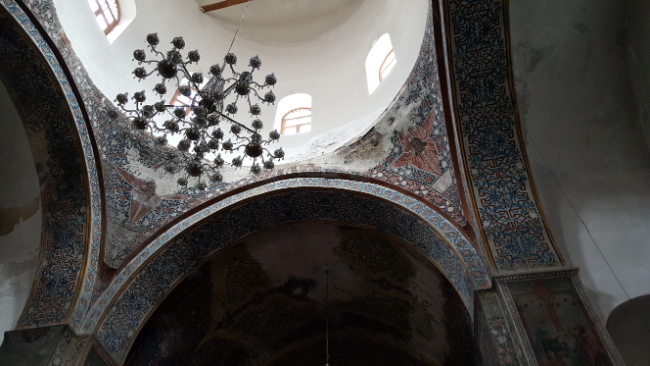 Again, the inside was filled with frescoes in the same style as the first church. 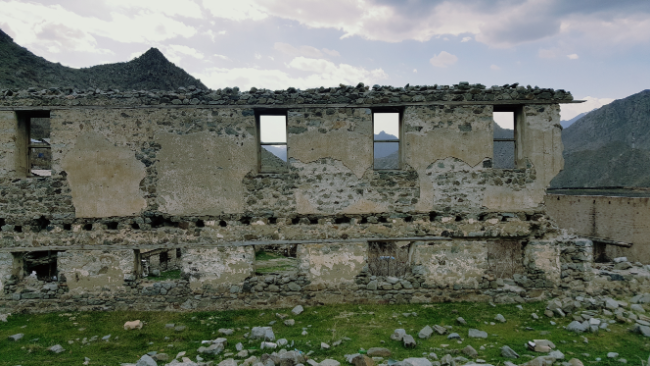 Inside Surp Hovhannes. Check out those arches! 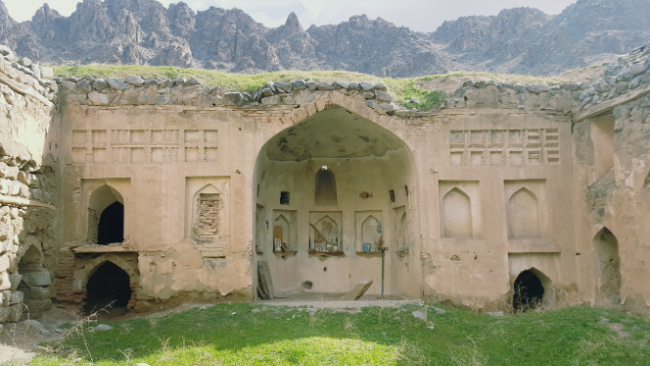 My last church stop was Surp Hovhannes. 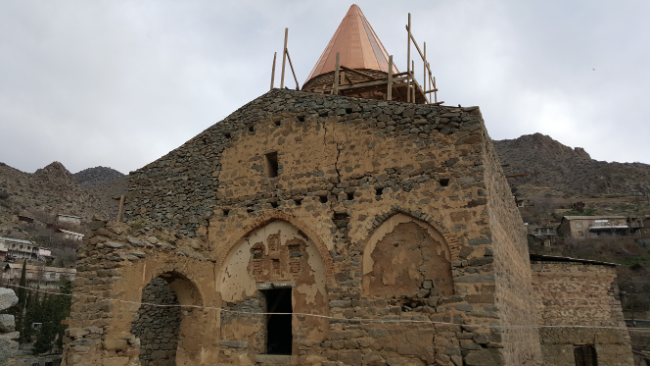 It’s in the worst condition out of the three churches and is undergoing some significant restoration work. Kelsey said some French organization is restoring it. It has a shiny, new roof on the cupola and there’s scaffolding all over the inside. The major interesting feature of the church is the arches inside. 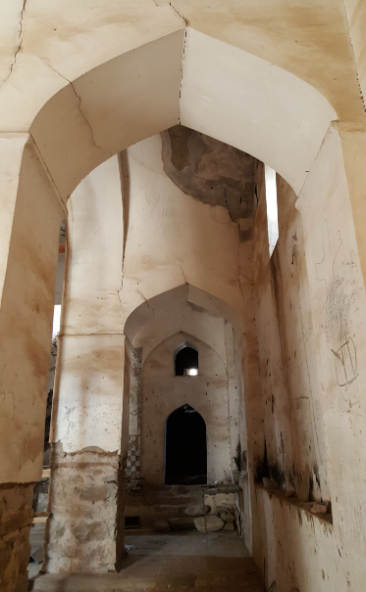 They look like Persian arches and were intentionally designed that way so that the Persians wouldn’t destroy the church if they came in and conquered the town. Since I still had plenty of time in the day and I wasn’t completely exhausted yet, I decided to climb to the other two fortress parts. I don’t know what way you’re supposed to get to them, but it’s definitely NOT however I went. I looked incredibly suspicious as I tried to find a way around all of the houses, and then I for sure walked straight down someone’s driveway and through their garden when I got tired of looking. Oh well. The climb to the first structure on the ridge was the most intense and highest climb of the day. 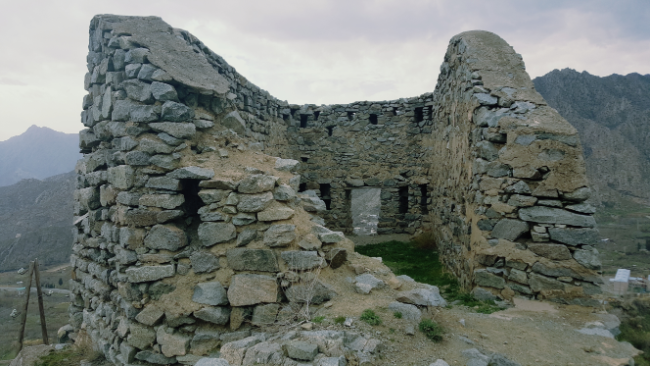 I don’t completely understand what the different things, but two of the structures I went to were rectangular and two were round. I guess the round ones are watchtowers, and who knows about the other two. I tried to understand via the internet, but that was less than helpful. 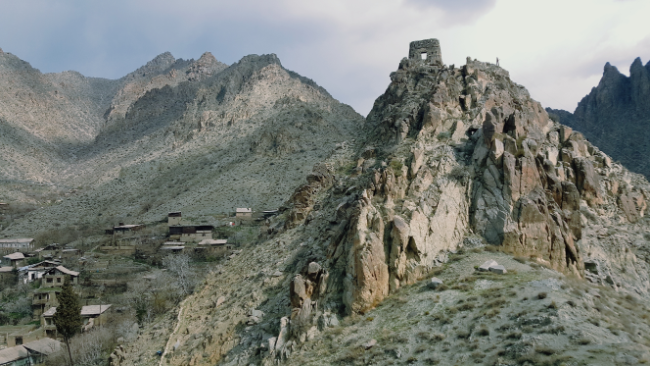 After climbing to the highest point, it seemed almost pointless to go to the last watchtower, but I figured it was basically on my way down… and I hoped that from there, I’d be able to see a less shady way off the mountain. Sure enough, I saw exactly the way I should have come up. It wasn’t through anyone’s yard or garden, and it would have made things a whole lot easier. Oh, well. Live and learn! Who doesn’t like a good ‘ole panorama? This is another one of those times when I wish I had a fitness watch or had thought to turn on a GPS tracker because it would be interesting to know how far I walked. Based on how my legs felt, it was a looong way. I was walking/climbing for probably like 5 hours, excluding stopping time and such. My conclusion about Meghri? It’s beautiful, the mountains are the best, it was absolutely worth visiting, and if you’re a lunatic who likes climbing things, you’ll probably agree.